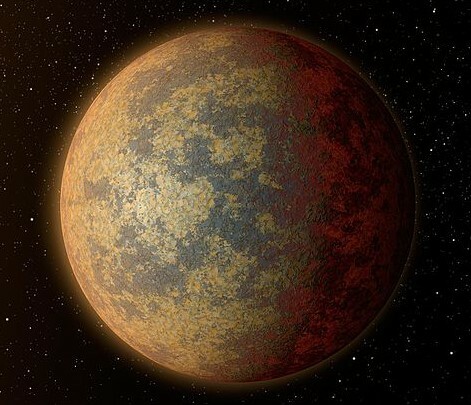 Artist's rendition of TVK E5695, one of the first discovered exoplanets hosting an SCP-3953-1 instance. Special Containment Procedures: A total of 20 Foundation outposts have been erected across the Costa Rican territory. Half of these outposts are dedicated to the research of anomalous seismic activity, while the other half focuses on locating and censoring the existence of SCP-3953-1 host instances. All discoveries of new exoplanets from astronomical institutes outside of Costa Rica are to be inspected for a possible instance of SCP-3953-1. If said instance is encountered, all images of the exoplanet in which SCP-3953-1 is possibly visible are to be edited immediately. All households in the residential street in which SCP-3953-2 is located have been purchased by the Foundation and repurposed as Provisional Site-398. Cover story 241 (Sewer Repair) has been implemented to prevent civilian access. Description: SCP-3953 is a phenomenon that affects all of the Republic of Costa Rica's landmass. This phenomenon is only triggered whenever seismic movement between the Cocos and Caribbean tectonic plates occurs. The intensity of these movements do not seem to be relevant to the triggering of the anomaly. The result from these events is an exact physical duplicate of the entirety of Costa Rica (hereon referred as SCP-3953-1) manifesting on the surface of any exoplanet of solid composition. All SCP-3953-1 instances discovered thus far have shown to be located in a manner mirroring the original Costa Rica's geographical position and size. The object is roughly spherical, averaging at 75%. The object has an estimated mass of 5.972x10241 or higher. The object is currently orbiting a star. The object has not been previously discovered by any organization focused on astronomical research, with an exception to those which are Costa Rican in origin. Since initial discovery, a total of 58 SCP-3953-1 instances have been documented. However, it has been theorized that over 1000 instances may exist due to Costa Rica's frequent tectonic movement2. SCP-3953-2 is a white, double story house located in Coronado, San José in Costa Rica. When entering SCP-3953-2 through any of its doors, the subject will be transported to the structure's duplicate version from a SCP-3953-1 instance. The duplicates of SCP-3953-2 do not share the original's anomalous properties. The SCP-3953-1 instance SCP-3953-2 transports to has been recorded to change every 24 hours. No pattern for which instance will become the next destination point has been found. It has also been discovered that, despite the vast distance, live audio and video are able to reach Earth without interference or delay. However, attempts to communicate from Earth to an individual located in an SCP-3953-1 instance has met with failure. The following is the audio log from an expedition performed via an automated motor vehicle into what has now been designated SCP-3953-1-Ω sent on 12/3/2017. The log has been translated from the original Spanish. The AMV enters SCP-3953-2. The setting depicted by the camera changes from SCP-3953-2's interior to that of a dense rainforest3. The AMV advances through the forest until two unidentified male voices can be heard. Voice 2: whispering Shhh! Did you hear that? Voice 2: It came from over there. The two entities then come into frame, revealing two men in protective gear carrying a variety of unidentified devices. One of the men yells "SPY ROBOT" right before the other shoots the AMV with a weapon that generates a beam of light, heavily damaging the sentry and rendering the camera non-functional in the process. Man 2: Huh. Doesn't look like it's one of the ones the 'Filis'4 use. Man 1: Maybe it's a new model. Man 2: Come on. It looks too old for it to be a new one. My best guess is that they still had some few functioning early models hanging around and decided to use them. Still pretty unusual of them though. Man 2: They usually shoot on sight or detonate themselves when they're found. It probably malfunctioned. Man 1: So… we could have died? Man 2: Yes. Now come help me get this thing back to base. I bet Herrera would love to dissect this thing. The AMV is heard being picked up by the men with relatively less difficulties than it would actually require. No commentary from the men can be heard. Various Alouatta caraya5 can be heard in the background6. This goes on for approximately 15 minutes before the men resume talking. Unidentified Voice 3: Gutiérrez! Douglas! What are you two doing here! I thought you two were sent to guard Section 9832-C like an hour ago! Voice 2: We were on our way until we found this spy robot. Doesn't look like the others I've seen, so I brought it here for Herrera to examine. Voice 3: You could have just contacted any of us to come pick it up later, you know? The Sergeant is gonna kill you if he finds you loafing around again. Voice 2: Meh, it's good exercise for Douglas over here. Voice 2: Either way, the entire zone is already guarded 24/7. It's not like they need another two guards around here or there any time soon. Voice 1: To be fair though, probably nobody would have noticed the robot if it weren't for us heading to nine-thousand-whatever-C.
Voice 2: Douglas, there's on-foot patrol for that. We are not on-foot patrol. The fourth voice is interrupted by an audible circuitry malfunction from the AMV, which is soon followed after by the sound of the previously seen weapon firing once again. The transmission is lost after this event. Further explorations were declined due to more possible hostile encounters. Localization of the host planet of SCP-3953-Ω is still ongoing. 2. It is of note that all found instances depict the shape of Costa Rica's territory in the present day, leading the Foundation to believe that this phenomenon started manifesting no later than in the year 1824. 3. This is the first recorded event in which SCP-3953-2 leads to an SCP-3953-1 instance where the 'receiving end' does not exist. 4. Possibly referencing the "filibusters", which was the name given to the army of Nicaragua (being led by American mercenary, William Walker) during their attempts to claim the territory of various Latin American nations. This information leads to the Foundation's belief that SCP-3953-1-Ω got created approximately 162 years ago. 5. Black howler, a species of monkey. 6. Audio analysis of the howls discovered that the vocalizations originate from an unidentified subspecies of howler monkey that does not match with current Foundation records.